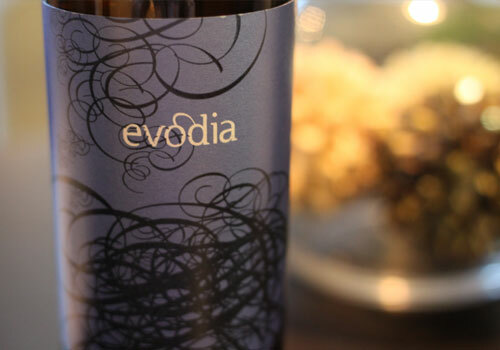 The Selection: Once again, I dipped into the May Top 10 list of the Reverse Wine Snob for some inspiration and selected the Evodia Granacha ’08 which will set you back about $8. My first pick from RWS was the Folie à Deux Ménage à Trois Red which split votes in our household. Interestingly enough, RWS published a new best list for July and both bottles fell out of the top 10. Guess someone is discovering some newer better wines. I had high hopes for Evodia since my previous Spanish Garnacha was Filon, which literally reminded of me bacon in an “I can’t believe this hasn’t hit the baconsphere yet” kind of way. Granted that was one of my last sips at the Wines4Japan benefit, but I maintain my tasting note accuracy since others sensed the pork delicacy as well. What Chris Said: Love the label design and color, very cool blue, but the cork was something of a warning – no branding whatsoever. Last time we had a no-name cork wine, we threw it out…but I kept an open mind and the Evodia did just fine. Nothing overpowering, but smelled somewhat floral, earthy, and almost stinky spice – which means it had a complex smell but one that made me think rather than enjoy. Those odd flavors (along with ripe red fruit) carried through the taste. While probably worth its $8 price tag, I think I’ll pass on it next time and search for Filon. What Linda Said: It’s an middle of the road, easy to drink red. There’s some tannin aftertaste so it’s probably better with a meal. It wasn’t that pleasurable to drink on its own. If this is around $10, I’d get it again.